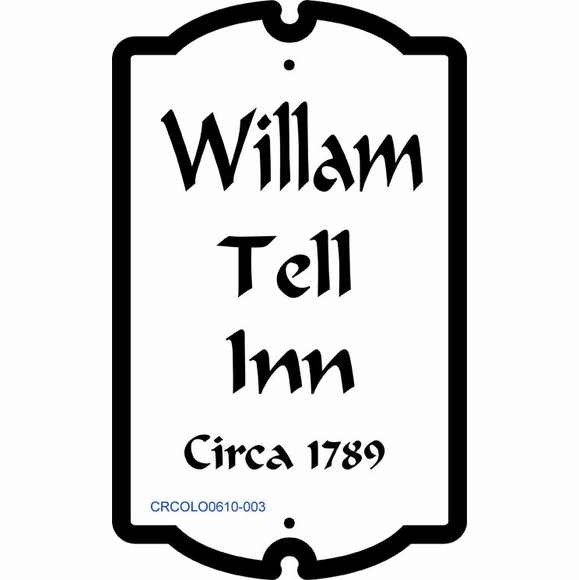 Personalized 4 Line Colonial Style Historic Sign - - designed as a circa sign to advertise the age of your colonial property, such as a traditional Bed & Breakfast, Airbnb, charming old inn, restaurant, farm house, or your restored home. Made in USA. Clients also refer to this item as our Built In Sign. 6" x 10" wall mount plaque uses a shape and font that might have been found on a colonial era building. Customized with your choice of color and the four lines of wording you specify. Line 1 holds up to eight (8) 1-1/2" characters. Line 2 holds up to eight (8) 1-1/2" characters. Line 3 holds up to eight (8) 1-1/2" characters. Border is the same color as the personalization and accentuates the unusual colonial shape. Dimensions: 6"W x 10"H x 1/8". Personalized historic information plaque crafted in the USA. To personalize this sign with your address instead of the circa date, please purchase our Personalized 3 Line Colonial Home Address Plaque (click top link in Related Products).